CONCORD, N.C. — MilkSplash(TM), the innovative new milk flavoring for parents who want their kids to drink more milk and make healthier beverage choices, is launching this week in select Target stores, and nationally at Walmart and other retailers in April. 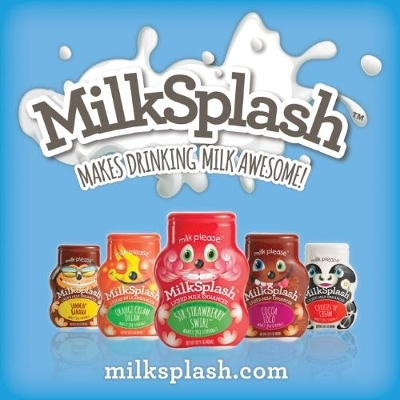 Created and marketed by North Carolina-based S&D Beverage Innovations, MilkSplash has a variety of great-tasting flavors, fun colors and engaging characters such as Cocoa Loco, Sir Strawberry Swirl(TM), Orange Cream Dream, Cookies ‘N Cream and Jammin’ Banana – with more to come. “Moms are also concerned about the amount of sugar in the beverages their children drink according to a recent nationwide survey, so they’ll be pleased to know that MilkSplash is zero calorie,” adds Dr. Zuniga. Following in the footsteps of liquid water enhancers and the positive impact they have had on water consumption, MilkSplash milk flavoring is doing the same for kids and milk. Every small bottle of MilkSplash makes at least 24 servings, requiring just a gentle squeeze and simple stir to turn white milk into a delicious treat kids love that lets them enjoy milk on their own terms. For more information about MilkSplash, including where to buy it, visit www.milksplash.com or call 1-855-MILKPLZ. MilkSplash was created by S&D Beverage Innovations, LLC, a division of S&D Coffee, Inc., the nation’s largest custom coffee roaster and blender of iced tea for the foodservice industry. Founded in 1927 and based in Concord, N.C., near Charlotte, S&D holds the highest certified designations in global quality and food safety, and counts a multitude of the world’s best-known foodservice organizations as its customers. A team of talented and experienced food scientists and marketers drives new product development for S&D Beverage Innovations.